Texas Land Commissioner George P. Bush, center, is recorded on a live internet video with Edinburg Mayor Richard Molina on Thursday, March 1, 2018, in Edinburg. Bush is running for re-election against several challengers for land commissioner. 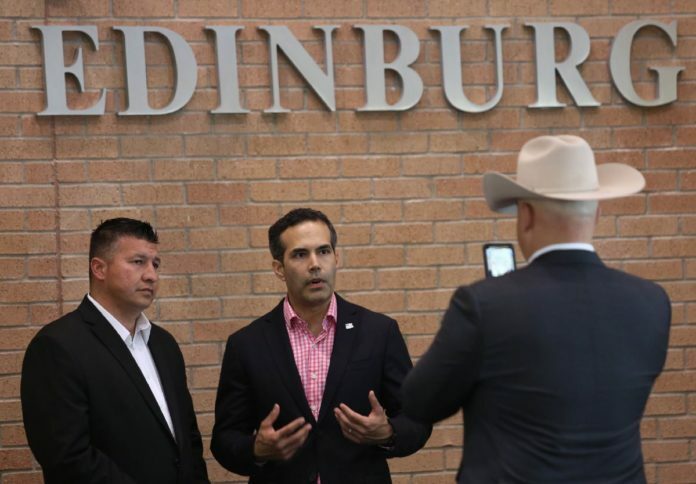 Land Commissioner George P. Bush made a whirlwind trip to the Rio Grande Valley late this week in an effort to clinch a second term in office in what has become a heated race. The Texas General Land Office, or GLO, has broad duties spanning from natural disaster recovery and coastal protection to funding public schools through the leasing of public lands and overseeing veterans-related programs. Elected to his first term in 2014, Bush — the son of former Florida Gov. Jeb Bush and nephew to former President George W. Bush — faces three opponents in the Republican primary, and the race has largely centered around two issues: the GLO’s handling of Hurricane Harvey recovery and San Antonio’s famed mission, the Alamo, which his office manages. While many have criticized the state’s response to Harvey, Bush touts the federal funds he has secured for the state, noting that the GLO manages a $5 billion disaster relief grant through the Department of Housing and Urban Development. HUD also awarded $12 billion to Texas, Florida and Puerto Rico for infrastructure development, which Bush says the state plans to use for flood mitigation. Bush’s Republican challengers, however, say the GLO was slow to accept money from the Federal Emergency Management Agency for housing repair. Yet, Bush says Texas lawmakers are equally responsible for the lack of preventive measures in place when Harvey made landfall. “We were the only proactive agency out there saying it’s a matter of time before a storm hits,” Bush says of unsuccessful efforts during the 2017 and 2015 legislative sessions to convince state lawmakers to invest in storm mitigation efforts. These included his office’s Texas Coastal Master plan, which called for beach renourishment and wetland conservation, and a study on a coastal barrier system, known as the Ike Dike. “Both ideas fell on deaf ears,” Bush said. The candidates in the Democratic race — Michael Suazo and Tex Morgan, one of whom will face the Republican victor in Tuesday’s GOP primary — also say the GLO must do a better job of working with state and federal agencies to secure funds for storm prevention projects. In addition, Republicans Rick Range, a retired firefighter, and Davey Edwards, a land surveyor, have questioned why Bush cut staff specifically tasked with rapid response efforts upon taking office. While he acknowledges the GLO’s limited funds to tackle projects on its own, Suazo says the land commissioner must be a staunch advocate for projects and policies that address climate change. “Bush has used his soft power to placate his political base,” Suazo said, charging the incumbent with taking to social media to push for conservative issues, such as the right to life, rather than GLO matters. Morgan, a software engineer, wants to make the process for leasing GLO-managed lands as easy as possible for companies that work to address environmental issues, such as coastal restoration. His Republican challengers also say that the restoration project takes the focus off the mission’s history, and Edwards has called for the Sons and Daughters of the Republic of Texas, who Bush removed from overseeing the site and replaced with nonprofit boards, to return in an advisory role. “No final decisions will be made on the design until we solicit public feedback,” Bush noted. As Bush set off to visit Hidalgo County polling places and meet with voters Thursday, he said President Donald Trump’s endorsement of his re-election campaign this week has provided momentum the land commissioner believes may push him through Tuesday’s primary.